Today's guest post is from the fabulous Jane at Mama Pea Pod. I love her blog. She recently had a Mermaid Party that I know my girls would have loved to attend. Ok, let's be honest. I would have wanted to attend too! The pictures just scream FUN!! Aside from all of Jane's fabulous child centered posts she also has a great series entitled - Time for Mama: Creative Playtime for Moms. The series is all about inspiring Mom's to find time for themselves and get creative. Be sure to check it out. For now, I leave you to Jane. 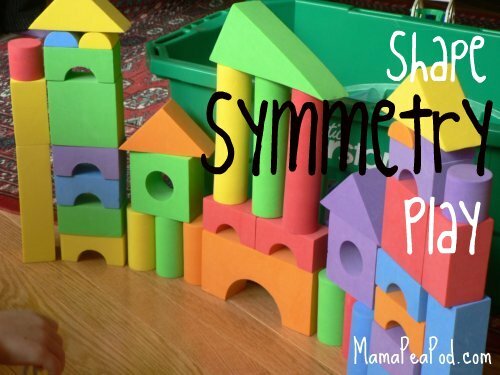 I know you will enjoy her post on Shape Symmetry Play. I love how she brings math into everyday play, making it fun and totally doable. Thank you Jane for sharing this fun idea with us here on Mom to 2 Posh Lil Divas. Princess Pea and I have been playing with blocks and learning about symmetry in the process, with some super simple shape symmetry play. We each build one side of a castle. I build my side first, then she has to copy it exactly on her side, matching up the shapes to make a symmetrical structure. It's great for shape recognition, problem-solving, and learning about geometry. As you can see, we didn't worry about matching the colours, just the shapes, but you could do that, too, if you liked. I was impressed with how well she did with it, and she was very proud of herself, too! Fun, play-based math learning, just the way we like it! I'm Jane and I am a mother, a teacher, and an endorser of play time. I blog at Mama Pea Pod about creative play ideas for preschoolers, toddlers, babies, and moms. I want to savour the time I have with my two little peas, aged 5 and 2, by playing, creating, and getting outdoors with them! I invite you to come join us for a play date at my blog, on Facebook, on Twitter, on Pinterest, or on Google +. Thanks for having me over today, Bern! Ooh great idea to do with my three year old. He loves block play of any kind and will enjoy the challenge. Great post!